The Lodge offers all of the comforts of your home with new friends to share it with. 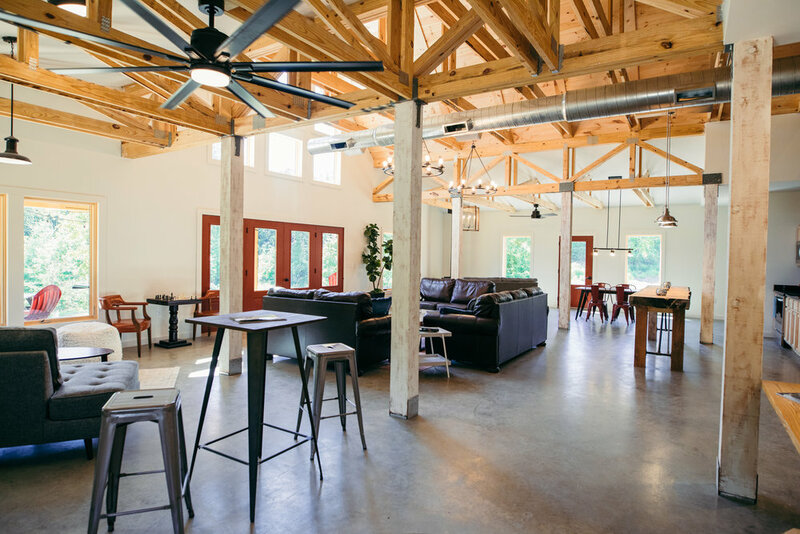 Our community space, at 1400 square feet surrounded by ample amounts of natural light, offers the perfect setting to gather, relax, and share stories. Our full kitchen is open to all guests and provides everything needed to cook breakfast to get your day started or to end your day with a big dinner. We also have spacious women's and men's family style bathrooms with multiple showers. Each shower has an adjoining dressing room for convenience. For sleeping you have the option of a private room that sleeps two or a bed in our community bunk room. Your choice of a private room for two or a community bunk. Complete Men's and Women's family style bathrooms with multiple showers and adjoining dressing room. Full kitchen with range, dish ware, flatware, pots and pans. Great room with ample seating, tables, and a wood burning stove. Outdoor living space with 45ft long back porch. Sound machines in all rooms. Our search for the perfect location, with convenience in mind, lead us to a beautiful spot on Big Andy Ridge centrally located to world class crags, scenic hiking, and minutes from Muir Valley and the Mountain Parkway. Whether you're visiting the RedRiver Gorge for the world class climbing or some of the most beautiful hiking in Kentucky a stay at BedRock will put you just a short drive away.